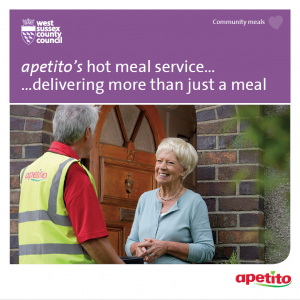 West Sussex County Council is proud to be working with apetito to support a ‘Meals on Wheels’ delivery service across West Sussex. Our home meals service ensures that you or your loved ones receive delicious and nutritious meals, delivered every day by our friendly and knowledgeable drivers. That makes this an ideal choice for those who, for one reason or another, aren’t able to cook for themselves: for instance if they’ve just come out of hospital. And, for your extra peace of mind, we’ll take the contact number of a friend or relative in case we have concerns about a customer’s wellbeing. We offer a very varied selection of nutritious main meals and desserts, 7 days a week – 365 days a year, to suit many special dietary requirements, including low fat or salt, gluten free or reduced sugar, vegetarian and vegan. You’ll see just how wide that selection is from the example of our menu choices attached to this booklet. You can choose from traditional favourites, like cottage pie, beef and roast potatoes, or perhaps spice it up with our delicious chicken curry. Follow that up with one of our many mouthwatering desserts, including classics like apple pie, rhubarb crumble or Bakewell tart. Because our range of meals is so varied, you’ll be able to personalise your daily choice to meet your own requirements and preferences. To ensure that they arrive piping hot, all our meals are cooked en-route in our specialist Chefmobil vehicles. If you’d like your meal to be dished up onto a plate, our driver will be happy to help. When we deliver your hot main meal, for a small extra charge we can bring you a tasty teatime pack too, including a sandwich, pastry and cake or fruit. You can specify exactly the kind of meals you want. For instance, just tell us if you don’t like rice, and we’ll make sure that none of your meals contains rice. And, as well as the special dietary requirements we’ve already mentioned, like low fat or gluten free, we also provide Kosher, African-Caribbean, Asian and Halal options. What’s more, for those who have difficulty swallowing, our award-winning soft and pureed range is the perfect solution. We’ll supply you with a four weekly menu cycle that rotates each week and includes soup, five main meal choices and three dessert choices, including reducing sugar and vegetarian options. Simply select your meal choices for the next week’s delivery on our order form and give it to your delivery driver or, if you prefer, just call us with your order. And don’t forget, our drivers are always happy to help with your orders. If you’d rather have a soup to start instead of a dessert that’s fine and, for just £1 extra, we can make it three courses: soup, a main course and a dessert. Your meals will arrive at lunchtime and, while we can deliver 365 days a year, you can choose how often you’d like your meals. It’s as easy as that. And, if you need help making your choice, just call us on 0800 084 3830. Increased demand for essential services, coupled with reduced government funding, means we need to reduce our spending in other areas. 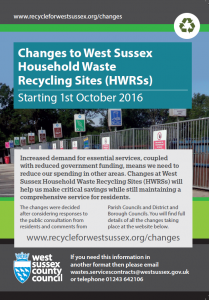 Changes at West Sussex Household Waste Recycling Sites (HWRSs) will help us make critical savings while still maintaining a comprehensive service for residents. 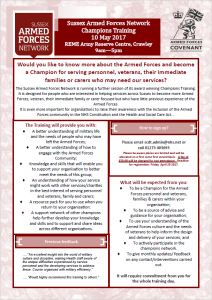 Would you like to know more about the Armed Forces and become a Champion for serving personnel, veterans, their immediate families or carers who may need our services? The Sussex Armed Forces Network is running a further session of its award winning Champions Training. 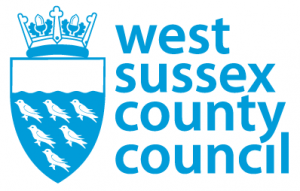 It is designed for people who are interested in helping services across Sussex to become more Armed Forces, veteran, their immediate family or carer focused but who have little previous experience of the Armed Forces. It is even more important for organisations to raise their awareness with the inclusion of the Armed Forces community in the NHS Constitution and the Health and Social Care Act.